Dario Meets The Costa’s Man of Music – David Jeffers Mairs | Marbella Marbella – Adelante! In these austere times, when a great deal of what is written in the press and seen on our TV screens contain volumes of news that is negative and is at times often depressing. But one man who continues to push positively ahead in life with his affable charm, and good humour, is my friend, the one and only David Jeffers Mairs, the amiable, talented, professional musician and entertainer from Scotland, who with his voice and music, keeps us all smiling and enjoying the numerous benefits of living on this sun-blessed coast. virility of Glasgow life, and later both working in the field of professional music and entertainment. David’s career began when he played organ in his first band at 15 years old and as his emerging talent became noticed by his peers, he worked with many top bands in Scotland and performed with names such as The Searchers, The Easybeats, The Tremelos, Love Affair, Edison Lighthouse and many more. He later emigrated to the Costa del Sol in 1991 where he met and worked with singer song writer Mel Williams arranging the music for Mel‘s stage productions “Professor Fossil” and “Don Zabatel” Then came live TV performing the music for Maurice Boland‘s breakfast show where he worked with Lonny Donegan, Mike McGere, Bonny Langford, Linda Nolan to name but a few. (mentioned in issue 63 of this very magazine), that is currently being used by “Children for Peace Onlus” a UNESCO recognised charity and one of the leading international charities, based in Rome. We’re honoured by the recognition of this complex and compelling music and the video, can be seen on the website www.marbellamarbella.es, along with David’s marvellous highly praised song, “Your Beautiful” that recently was also used by the charity for their website. To help promote the Costa del Sol by using the power of music, we also wrote the music for a CD album titled “Living In The Sun” that is also on the Marbella Marbella Adelante site and You Tube. Besides his love of music, David is a willing supporter and energetic worker for various charities and his wife, Linda organised a successful charity event at Mijas Playa to raise money for Alzheimer’s Research and invited the cream of Costa del Sol‘s talent to help, with popular radio presenter Maurice Boland who compered the event. This was followed by a sensational parachute jump in Scotland, the first in his life, which he found exhilarating to put it mildly and raised considerable money for the charity. 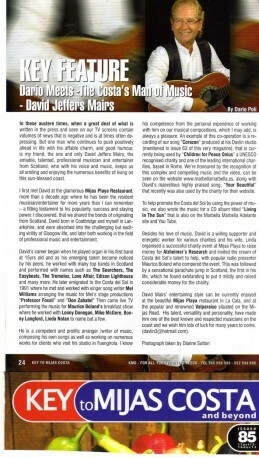 David Mairs’ entertaining style can be currently enjoyed at the beautiful Mijas Playa restaurant in La Cala, and at the popular and renowned Valparaiso situated on the Mijas Road. His talent, versatility and personality, have made him one of the best known and respected musicians on the coast and we wish him lots of luck for many years to come. (davlin3@hotmail.com). Photograph by Diane Sutton.